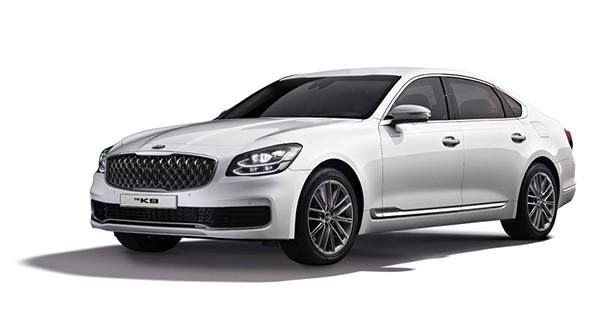 South Korea’s Kia Motors said on Monday it has launched a face-lifted K9 for 2020 with an automatic navigation system for enhanced convenience and safety. The carmaker’s first automatic navigation update system allows for automatic downloads and installations while the navigation is in use. The car connects to the navigation server by itself to check the current version of the map and software and automatically update it for the latest information, while the engine is on. The K9 also applies the external air inflow prevention control to all three trim models as a default. When this function is activated, it automatically closes windows and switches to air conditioning to the internal circulation mode when the car enters a tunnel or other places with a high level of air pollution. The 2020 K9 sedans are available with a basic design or a new sporty design. In the basic design, glossy chrome plating is applied to all molded parts on the exterior, such as the radiator grille rim, bumper molding, side garnish and the rear combination lamp bezel. In the new sporty design, the sedan features a radiator grille with a three-dimensional pattern, a new 19-inch wheel consisting of thin spokes, and satin chrome plating applied to the exterior molding. The K9 is available in three trim options with a 3.8-liter gasoline engine retailed at 54,190,000 won (Platinum I), a 3.3 gasoline turbo engine or a 5.0 gasoline engine retailed 65,580,000 won (Masters II) and a 5.0 engine model retailed at 91,790,000 won (Quantum).